How Do Exhaust Tips Work? 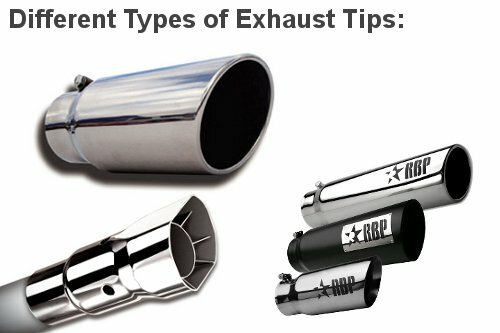 A few people have asked us how exhaust tips work and what they do, and while the answer to this question is really simple – exhaust tips usually have no impact on an exhaust system and are mostly for show – the question itself suggests that a basic run-down of an exhaust system could be helpful. So, if you’re wondering about exhaust tips, it might be a good idea to read our article that explains how exhaust systems work. Turn-down exhaust tips (see image below) are intended to point sound and hot exhaust gas downwards…and these tips may have an impact on performance (but the impact is slight). 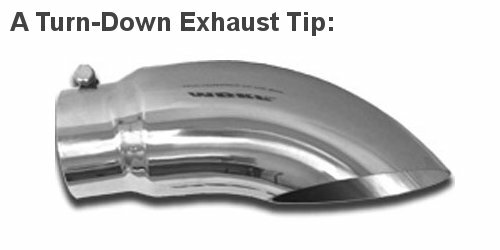 Turn-down exhaust tips can be used to quiet a noisy exhaust and/or deflect exhaust gas away from the vehicle. Truck owners, for example, will use a turn-down exhaust tip to keep hot exhaust gases from damaging whatever they’re towing behind. Exhaust tips should be chosen based on material and design…here’s a list of different materials and their benefits, as well as a list of the most common design options. Do you need to protect your trailer from hot exhaust gases? If so, a turn-down exhaust tip might be a solution. However, they’re not 100% effective. It might be better to ‘move’ your exhaust system exits to the side of your truck. Do you need to protect your exhaust tip finish from being tarnished? Metal exhaust tips (chrome, stainless steel, and titanium) can change color when exposed to the high temperature exhaust gas. Some tips have spacing between the “show” finish and the actual pipe exit, which helps prevent tarnishing. Chrome exhaust tips are the best option if you’re looking for shine. While it’s true that you can polish a 304 stainless steel tip, they don’t shine quite as brightly and often develop pitting over time. Both stainless steel and chrome exhaust tips are weather and rust resistant. Titanium exhaust tips are expensive, but they’re incredibly light weight and they often develop a very pleasing blue tarnish over time. Carbon fiber exhaust tips are also very expensive, but they’re never going to tarnish. Keep in mind that really expensive exhaust tips (like titanium or carbon fiber) are more likely to be stolen than a more ‘normal’ stainless or chrome exhaust tip. Some exhaust tips must be welded onto your vehicle, but many use a simple pipe-clamp or screw-tight attachment system. The pipe clamp or screw tight install can be completed by anyone with a screwdriver or simple socket set, which makes these very easy to install. If your exhaust tips require welding, your local muffler shop will be able to attach them for a nominal fee. hawgsfan – That’s a cool idea, but I can tell you that 90% of the time the exhaust tip has absolutely no impact on sound characteristics. The acoustics of a vehicle’s exhaust system are mostly influenced by the muffler(s), with tips only coming into play when they’re turn-down tips, or when the length of the exhaust is really short. So, for a truck owner like yourself, the only thing to think about is whether or not you want turn-down tips. If you owned a little mid-engined 4cylinder (like a Toyota MR2, which has almost no pipe behind the muffler), then exhaust tips would become much more important…but for trucks? Not much. I just had a new muffler and exhaust tip put on a 5.0 V8 benz. I noticed that if you look at the exhaust tip on the inside there is what appears as “venting” holes; like what you see on big machine guns barrels. Any idea what those serve? Noise, performance, aesthetics…etc? speedysvt – It could be that they have some effect on sound, but my guess is that they’re aesthetic. I’ve never really tested that or asked anyone…I’ll comment back if I learn anything. thanks, I’m having trouble finding any info or even looking up a proper search on line for info. My mustang has turndown. it is much louder then keeping straights (imo). I just have been pushing off getting my tips welded on. I was told it will give me a more throaty sound if I do it. I aways assumed he was just trying to make a sale. Should the tip of a turned down muffler tip on V10 ford motor home be cut at an anglled? Thom – Cut and weld on the new ones, with some length of tubing if necessary.